Thanksgiving seems to have come awfully quick this year - I just read the casual phrase, "for the holiday dinner next week." Wait, what? NEXT WEEK?? 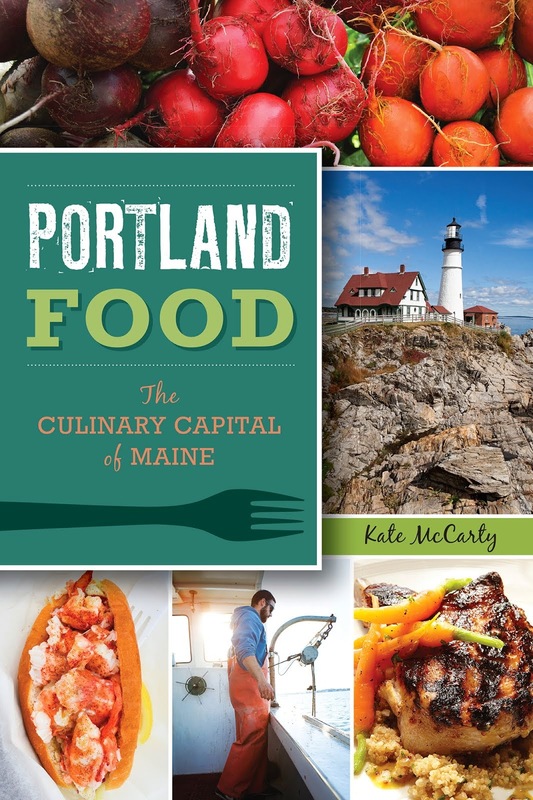 Since I'm hosting dinner for friends this year, I'd better get my menu plan on. 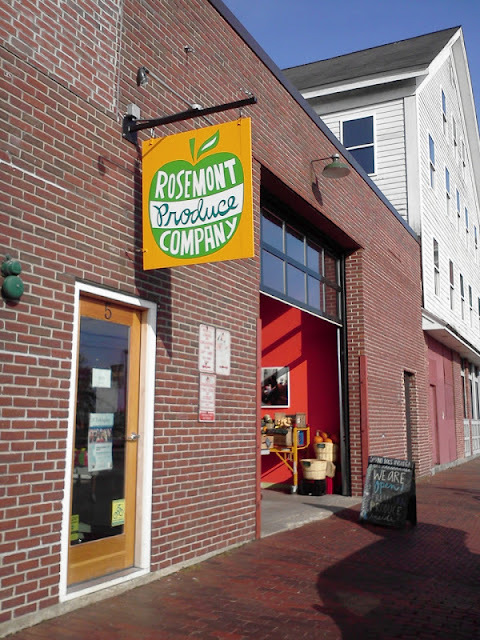 Rosemont, being the purveyor of all things local, has turkeys from Mainely Poultry, located in Warren, that are free range and cost $3.99/lb. 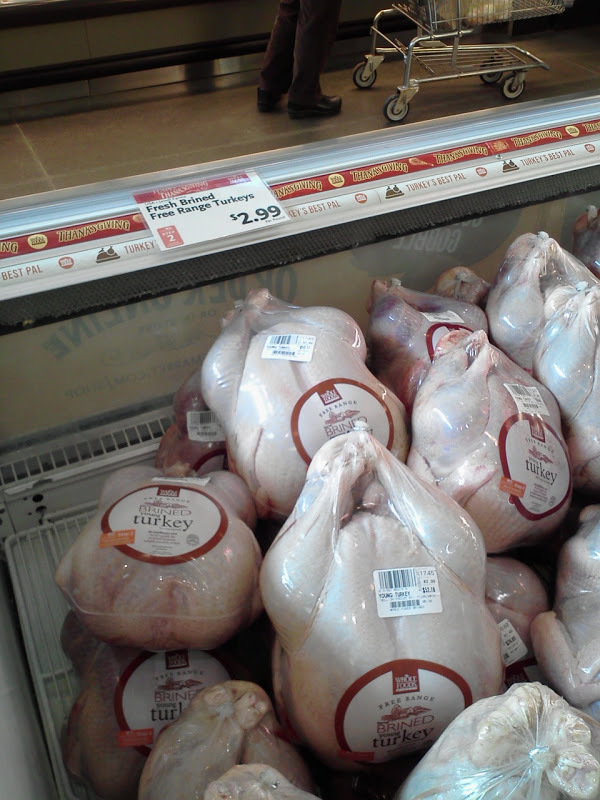 They also have organic, pasture raised turkeys from Serendipity Acres in N. Yarmouth at $4.69/lb. Birds are available in 13-16 lbs., 17-20 lbs., and 20 lbs. and up. You need to order your turkey by this Saturday, and they're available for pick up the Tuesday and Wednesday before Thanksgiving. 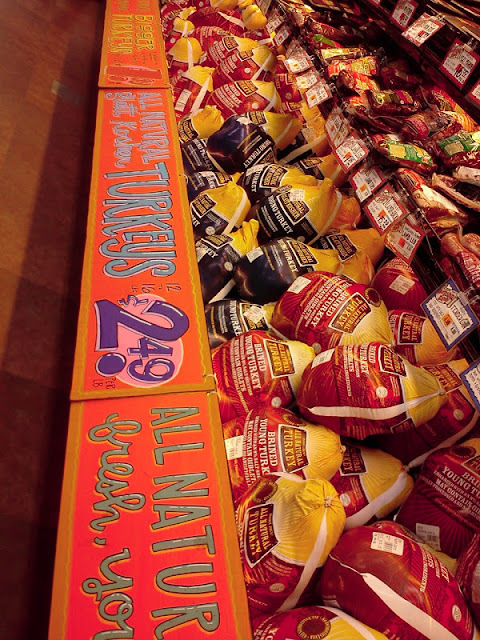 Whole Foods has several options for turkeys: free-range from Jaindl Farms, plain at $2.49/lb., brined at $2.99/lb., herb-rubbed at $2.99/lb, and organic at 3.99/lb. Birds are available in an 8-20 lb. range. The birds are antibiotic and hormone-free (hormones are prohibited by law in raising turkeys), raised on vegetarian feed, and given an "enriched environment" to live in. 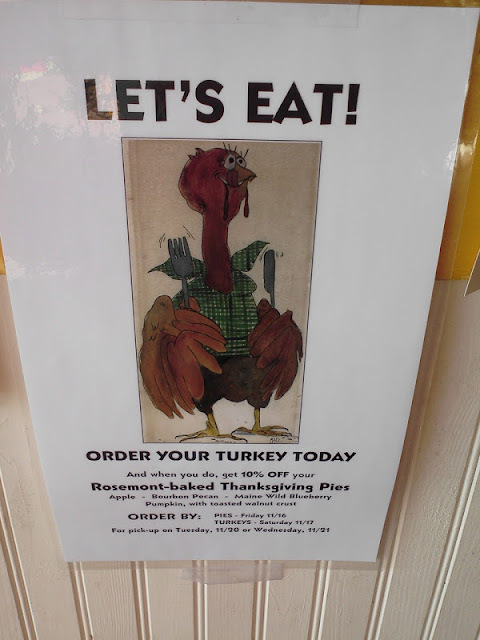 You can watch a video of the turkeys hanging out through the Jaindl Farms website. They also offer a free range bird from Koch's Turkey Farm, which is a certified humane farm. The turkeys are 10-24 lbs. and are $3.99/lb. Another free range bird comes from Plainville Farms in Pennsylvania, and is all-natural (no artificial ingredients, flavors, etc. ), fed a vegetarian diet, and antibiotic free at $2.99/lb in a 8-30 lb. range. 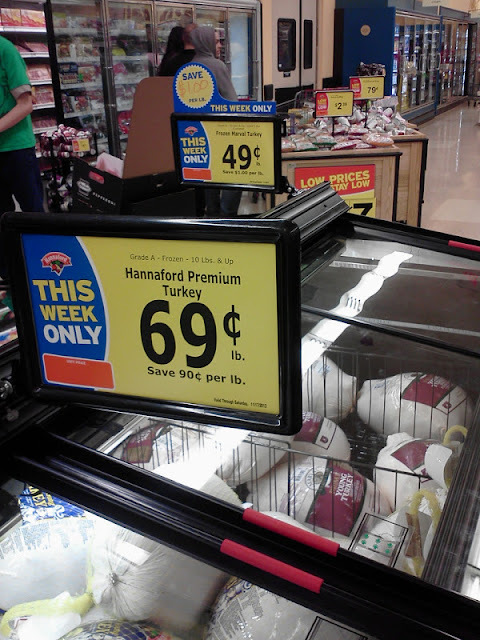 Hannaford Brand, $.69/lb., 10-21 lbs. Shady Brook Farms, $.99/lb., 14-15 lbs. Butterball "All Natural," $1.99/lb., 11-20 lbs. Marval and Shady Brook Farms are both owned by Cargill, the highest grossing privately held company in the world. I try not to go too far down the rabbit hole while researching the treatment of turkeys for this post, but I didn't have to read very far to think that these are not the types of people I'd like to be supporting while enjoying my 'things-I'm thankful for' dinner. Hannaford Brand and Nature's Place meats are difficult to find any source information about, other than on the store's website. And Butterball, well, Butterball employees have been convicted on felony charges of animal cruelty twice this year. OK then. 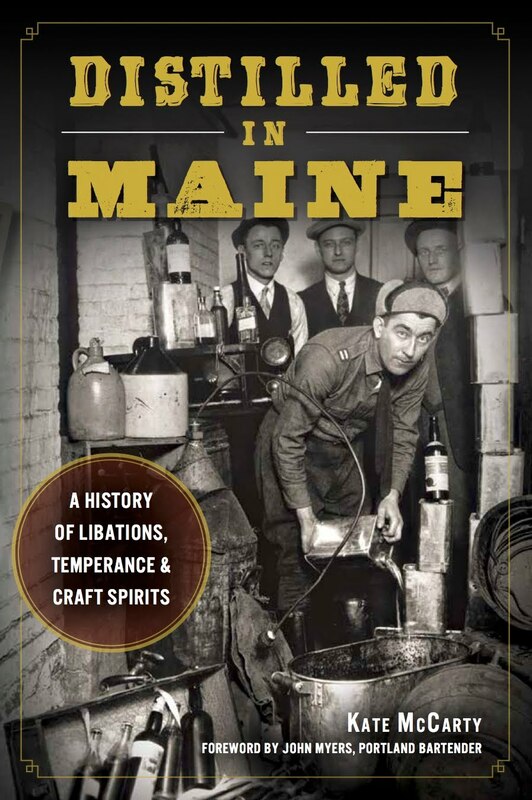 I thought I'd be nice and include Shaw's, even though I hate it, and it's not in downtown Portland. But maybe you're unfortunate and live near one. 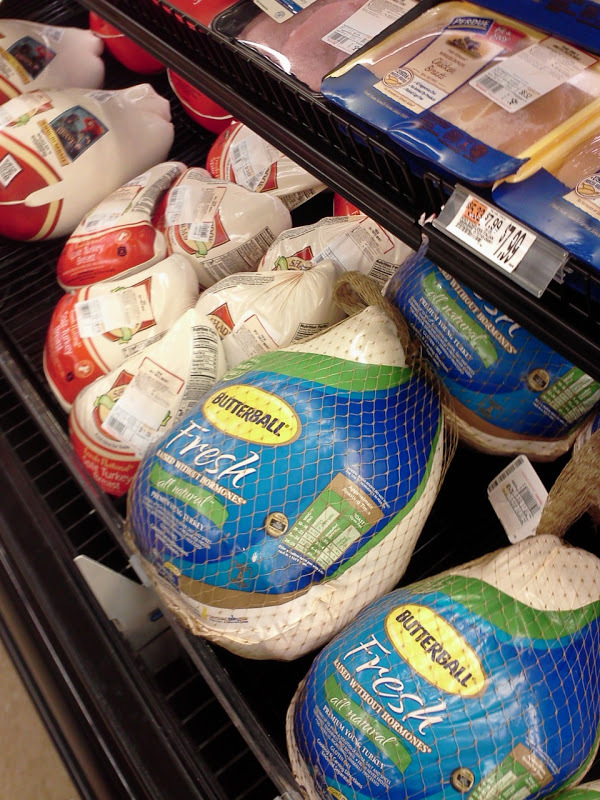 They have two options - Butterball again for $1.29/lb. and Jeannie O at $.69/lb. 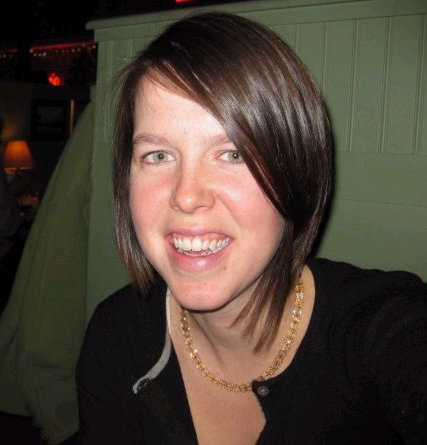 Jeannie O is produced by Hormel Meats, which is the number 2 turkey producer in the country, second to Cargill. My brief google search reveals multiple instances of antibiotic-resistant salmonella contamination in their meat. Trader Joe's turkeys are $1.99/lb. 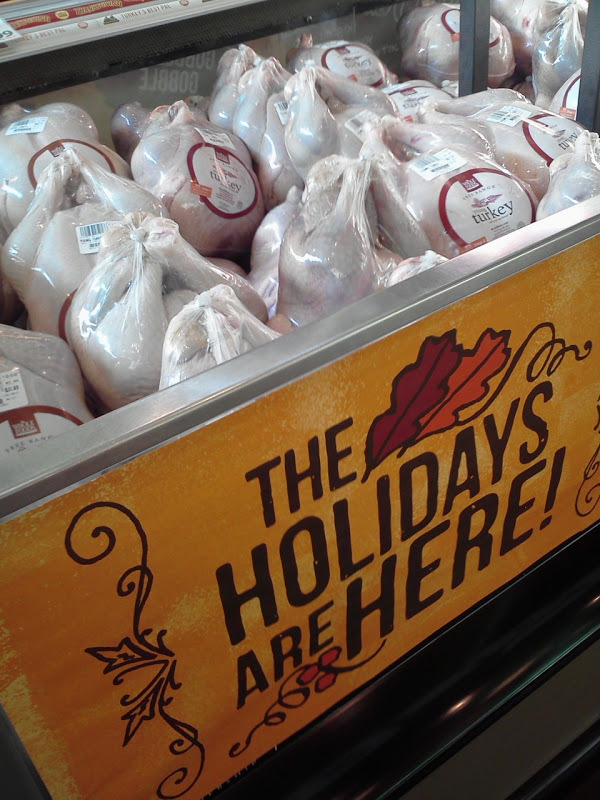 brined or $2.49/lb. for a Kosher bird. Their range of sizes is from 12 to 22 lbs. and are vegetarian fed, free of antibiotics, and the Kosher designation means the poultry was prepared under rabbinical supervision. While Trader Joe's is famously secretive about their product sources, the Empire Kosher wiki page says that their products are distributed to Trader Joe's. So maybe that's their source? Apparently Kosher standards are stricter than that of the USDA and require a cage-free environment. 7. Trader Joe's store brand Kosher, $2.49/lb. 10. 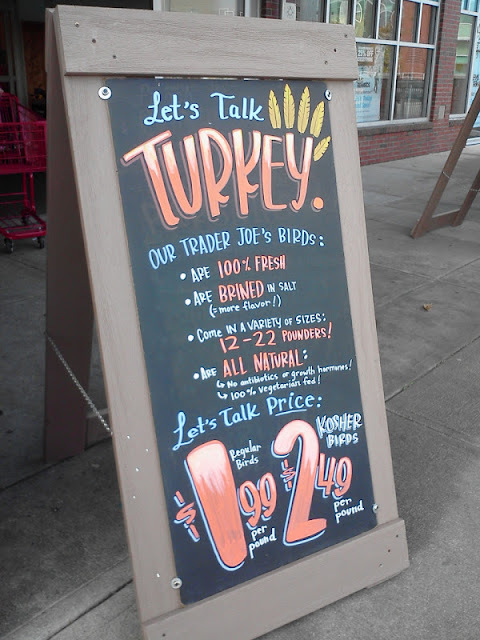 Trader Joe's store brand brined, $1.99/lb. 14. Hannaford store brand, $.69/lb. So, assuming that you're not out to get a 15 pound turkey for less than $10 (ew), I think that the birds from Whole Foods strike a nice balance. Their meat is traceable to it's source, their farms are inspected and certified by a third party, and they mean doesn't contain any antibiotics, hormones, or animal byproducts. I wish I could afford to buy a turkey from a Maine farmer, as I trust them, and my dollars will support our local agriculture. Frankly, researching the source of my animal products is becoming exhausting. I want to trust the companies, but really, it's so hard to tell by reading their marketing glop. At the grocery store today, I turned away from the lettuce heads, as a sign warned me that they had been subjected to "post harvest treatments." (Creepy.) Seeking organic lettuce, I found a sign recalling bagged spinach due to an E.coli outbreak. What is going on? Why must it all be so difficult? I am looking forward to cooking a meal with my lovely boyfriend to serve to our friends, of course, but already the sourcing of ingredients is stressing me out. At least my local farmers' market will supply most everything I'll need. Thanks for reading my rant, and I hope you weigh in with what turkey you're getting, how much it was, and why.